James Taylor-Foster: You didn’t originally set out to make a film about architecture but about a family of architects: the Böhms. However, it’s become one of the most captivating architectural films I’ve ever watched. Concrete Love, it’s title, is so apt—how did it begin? Maurizius Staerkle-Drux: The first time I entered the Böhm family home in Köln, I saw a large picture of the church of Neviges but I didn’t realise what I was looking at at the time. It had a caption in German which translates to “concrete mountains” (or something along those lines), and I really enjoyed the combination of words. I had wanted to make a film about a family ever since I graduated from film school. The idea of a film about architecture hadn’t crossed my mind, I had no idea what it was all about. I was also confronted by all the clichés associated with films about architecture—particularly that they’re mundane! 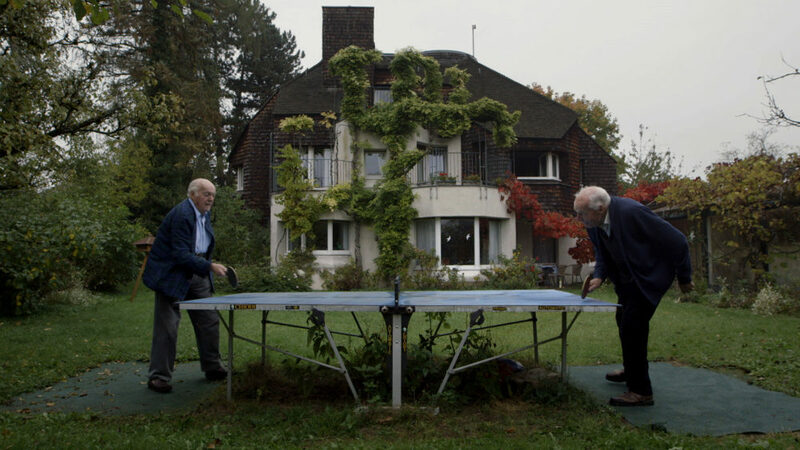 When the film finally started to get its form, I called it Architektur einer Familie (Architecture of a Family) and this became the main title—and remains so for the German-speaking world. I like the notion of how the families build things together (in this case, literally) and I was always looking for connections between them and what they have built. 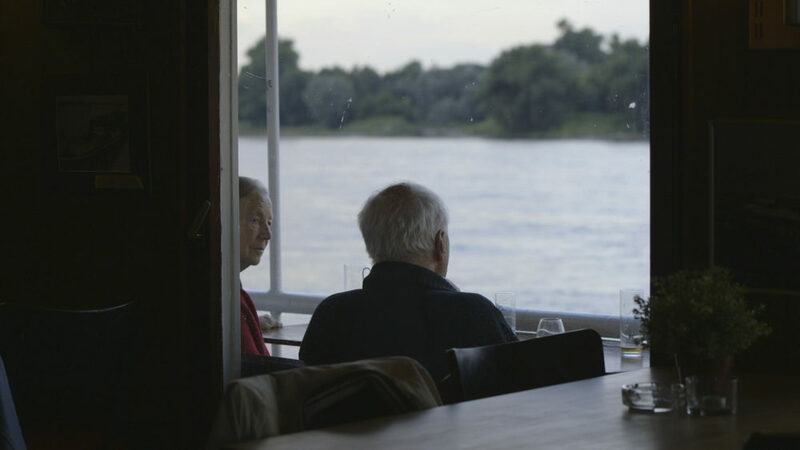 At its core the film centres around the love between Gottfried and Elisabeth Böhm (née Haggenmüller), two people who knew each other for over seven decades. They knew everything about one another, and as time went on I began to compare their love to the enormous concrete walls of their structures. It was a natural metaphor. But even though love has a powerful ability to endure, it is—to a certain extent—built around tension and friction. Let’s rewind to the beginning of the project: how did you initially approach the Böhm family? In other words, how did such an intimate portrayal of a rather private family unit come to be? To start at the beginning, although I live in Switzerland, I was born in Köln. My mother, also born there, went to school with Peter Böhm [son of Gottfried and Elisabeth] and had known him for a very long time, so it was through her that I initially got access to the family. It was around this time that I was finishing film school, and I really wanted to make a film about family—I just didn’t know whether it was about my own, or another. Shortly after, I was introduced to Elisabeth, and I became fascinated by her. I just started to film her and Gottfried together in his working room, with no clue as to a potential narrative. At that time I was interested in their relationship above all else. What fascinated you in particular? We were sat in this working room, Gottfried hunched over his desk and Elisabeth on the opposite side of a large table—her memory loss at this point was worsening. Occasionally, their sons would knock on the door, pop in to ask something, and leave again. It was dull, you could say, but I enjoyed it. Nothing really happened, but it allowed me to get to know Gottfried. He’s a very quiet person, but deeply interested in everyone around him. He’s the type who will ask you many questions but give very little away about himself. 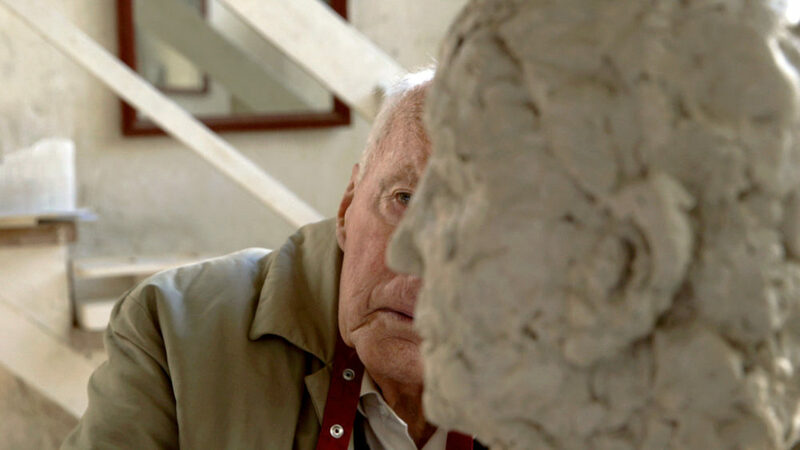 That’s part of the beauty of the narrative you weave: that what you, as the viewer, learn about Gottfried and the buildings are not through him but through interviews with his sons, or simply through silent moments during which we simply watch him draw, scratch ink off a sheet of trace, or sculpt clay. Creating such an intimate view meant building a relationship with him and, as with any relationship, you fight for it. You have to try and understand where the boundaries are, how far you can go. I desperately didn’t want to push it to the point at which he might no longer be willing to be so open with me. It sounds like a stressful process? It was, in fact. I realised that after the three years spent making the film, and feeling the pressure gradually mount, that I wasn’t really worried about making a good film or not per se, but about keeping this special relationship that we’d built. I didn’t want him to see anything relating to the footage we were taking so he wouldn’t be aware of himself, which meant that when it came for the film to be screened I had no idea how he would respond. Let’s talk about your process. The narrative of the film works so well—did you film and then shut yourself in an editing room for months to piece together the story, or did you begin to piece it together as you were filming? I just filmed, which meant there was an enormous amount of material. 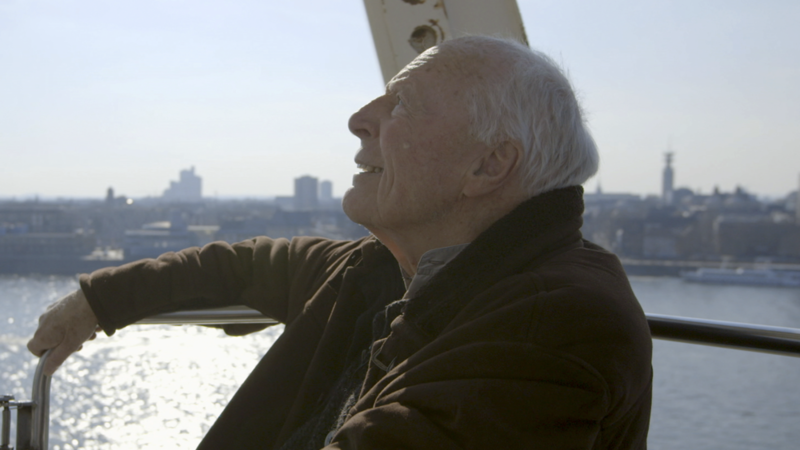 My producer told me that a standard feature-length film of 90 minutes has about 30 to 40 moments, and encouraged me to mentally retrace the years I had spent filming the family and pick 30 moments that were important to me. So I did. I spent around three days compiling a rough cut. In this process you pick up on lots of little things you didn’t originally notice—themes and motifs, like Elisabeth’s recurrent red scarf. What was the most important motif, theme or object that you noticed? I remember seeing something in the background of one of the shots. I zoomed in to find a sculpted bust of Elisabeth. I later asked Gottfried what it was, and he explained that it was a sculpture of her he made around the time when she began to really lose her faculties. He wanted to capture her in a particular moment, as it were; to keep her alive at a time in which she was increasingly forgetful. I asked him whether he would reenact this for the film, and he agreed. It is one of the most complicated scenes in the film in terms of how we had to shoot it. I set up a table in a darkened room, and the entire crew—of which there were about 10—stood outside. Gottfried was alone. I get the sense that this was where you as a filmmaker felt most comfortable: scenes with people. But Concrete Love features buildings, and quite complex architectural spaces. How did you approach these sorts of scenes? At first I was really afraid to tackle their œuvre—there are so many projects, and I had never purposely filmed a building before. 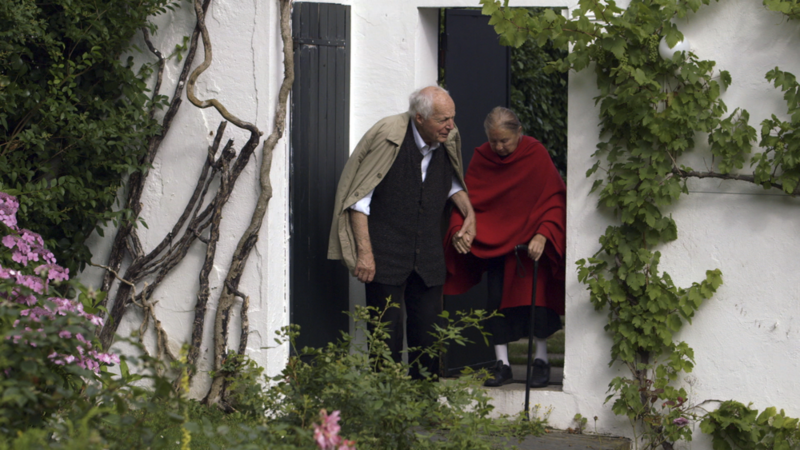 I felt that I was never going to get it right by myself, so I just put myself in the shadow of Gottfried and Elisabeth; where they went, I went. I would encourage them to take trips to their buildings—whether to church or to a concert. Just by being with them and listening to them talk, I began to understand more about the language of architecture. Before then I didn’t have a clue what they were talking about: façades? Connections between old and new? I had no idea. And I suppose that the family all talk in a sort of archi-jargon? All the time—they live it. I remember going for beer with Gottfried and our cameraman, Raphael Beinder, in Köln. I was nervous so I started to play with the coaster—you know, ripping it to pieces. Suddenly he picked them up and started to try to piece them back together in the form of a building. And he was serious: when I subconsciously took a piece away, he subconsciously put it back. 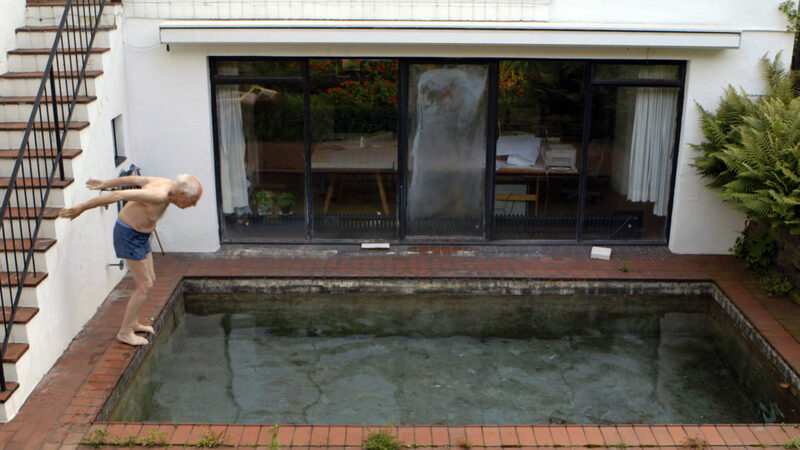 They whole family live together just outside Köln, in a home built by Gottfried’s father, Domenikus Böhm. Does it feel insular to you? Yes, and I made a conscious choice to try to create a sense of their home by representing a closed familial universe in which each member rotates around Gottfried in a cosmos of relationships. Watching the film, you’re unsure of where the individual rooms are in relation to one another, for instance. They’re actually spread across a series of houses close by—but you wouldn’t know that from the film, necessarily. It’s as if, in this sense, their projects represent a wider constellation. How did you come to know Neviges? You were too busy looking at them! It’s true—I just didn’t understand the significance of where we were. This was also around the same time that I was filming their long-time gardener in Köln. I asked him whether or not he knew of any old models or objects relating to Neviges, and he produced a cardboard model of their original competition entry. It was made because the Bishop was almost blind at the time, and so Gottfried wanted him to be able to physically feel the proposal. I went back to Neviges without Gottfried and Elisabeth on a day when a concert was playing. I make my living as a sound designer—making sounds for films—and as I entered Neviges I remember being unable to locate where the sound from the orchestra was coming from. It was almost a spiritual moment for me; I realised that I was being moved by the building, and the church was making me feel a certain way. I had to locate myself within it, and reconfigure my existence in space. I experienced it through sound, as it were. The same could also be said for visual senses, too. When I first visited, it took around 15 minutes for my eyes to adjust from the bright, overcast white light outside to the cavernous space of the church. You’re initially drawn to a radiant, blood-red rose window in the corner—but the vaults above are pitch black. As they reveal themselves, you start to realise that you’re in a far bigger space than you initially realised. But in those early moments, you’re relying on your hearing. Absolutely. I once asked Gottfried to talk a little about how Neviges was built, and he just said how grateful he was that so many people supported such a “crazy idea.” I suddenly understood that there were no computer modelling, no digital engineering, no renders to rely on. They had schematic drawings, and then he directed the build on site. So the building was somewhat improvised. It must have taken a great deal of self-confidence. For sure. I once found footage of him as a young boy—really charming and a true extrovert. But now he’s the opposite, so to speak—very quiet and somewhat of an introvert. None of his sons could really explain why he changed, when I asked them. But my feeling is that the Second World War changed him. He was part of a very elite, mountaineering force in the German army; part of the group of soldiers that went into battle first. That must have had a profound impact. And then to return to Köln and see that the city had been bombed to ruins must have been difficult too. With the Madonna of the Ruins church (upon which Peter Zumthor later built the Kolumba Museum), he was one of the first architects to face the challenge of rebuilding the city. Exactly. He went from soldier to church builder. And Stephan, his son, once noted how even to this day he cannot bear rhythmic clapping at a concert, for instance. He has never spoken about his part in the war, not with his sons nor with Elisabeth, even. But we do know that he spent considerable time in the mountains. He himself is a large-framed, broad, imposing figure; a sort of human mountain. Neviges, in that way, is a concrete mountain and does—to my mind, at least, and in one way or another—represent concrete love. with Maurizius Staerkle-Drux for LOBBY #5, "Faith"